The merchants of Downtown Ukiah pride themselves on being small business owners. It takes a lot of hard work, time, and dedication to run your own business. Being open on Sundays is a pinnacle part of our Downtown area; giving consumers the opportunity to have a relaxed shopping experience over the weekend. This December, the above merchants have committed to being open on Sundays for your shopping and dining pleasure. We can guarantee that you can get a special something for everyone on your list for the holidays. 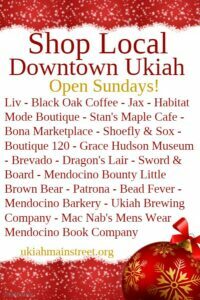 Whether it be clothes, shoes, jewelry, gift cards to your favorite eatery, or Downtown Dollars, make Downtown Ukiah your one stop shop for your holiday needs. Thank you to our merchants Liv, Black Oak Coffee, Jax, Habitat, Mode Boutique, Stan’s Maple Cafe, Bona Marketplace, Shoefly & Sox, Boutique 120, Grace Hudson Museum, Brevado, Dragon’s Lair, Sword & Board, Mendocino Bounty, Little Brown Bear, Patrona, Bead Fever, Mendocino Barkery, Ukiah Brewing Company, McNab’s Mens Wear, and Mendocino Book Company. Right here in the heart of our city there are several different dining options to share with you. It’s as if the unofficial menu of California eats all met in our downtown. From wood fired pizza to California sushi and a Mexican restaurant too the options are plenty. Those just list a few. The eateries in our district offer small plates and something heartier as well. Healthy options are on every menu and several vegetarian selections join the menus. Park and stroll and decide where to stop. 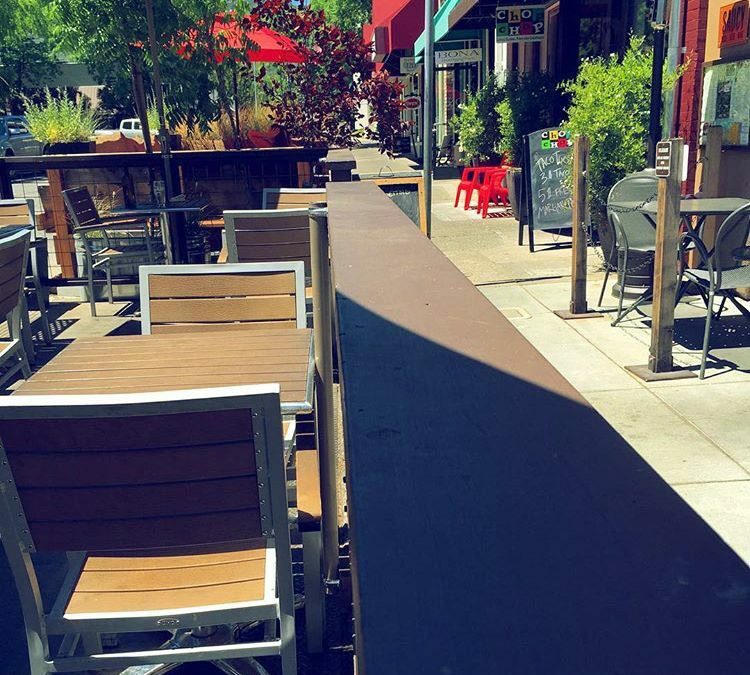 Outside seating is an option too! We boast a local brewery with a restaurant inside so you can enjoy a meal while tasting the brews of your choice. Not a beer enthusiast? The wine selection downtown is rich with selections local to our region and beyond. Check out the restaurants for fun specials and happy hours and specialty cocktails from the full bars. Many of the chefs use locally sourced food and what is at the market is what appears on the menu! The North Bay Bohemian writes: The stretch of 101 for a long time held few high-quality options but that’s changing and downtown Ukiah’s Saucy is leading the pack.